(Nanowerk News) An efficient, robust, and compact wind power plant with a 10 MW superconducting generator is being developed by partners from industry and science within the recently established EU project SUPRAPOWER. Superconduction enables considerable savings of energy and raw materials. Within SUPRAPOWER, researchers at KIT’s Institute for Technical Physics (ITEP) develop a rotating cryostat cooling the superconducting coils down to minus 253°C - a temperature crucial for electric current flow without resistance. Wind power will make a major contribution to the energy turnaround. Efficient power generation by means of offshore power plants requires powerful, reliable generators that do not cause disproportionately high logistic efforts and do not require complex foundations. Using generators with superconductors, performance can be increased to 10 MW while at the same time reducing the units’ weights and sizes. Besides, superconducting generators can be built with less than one hundredth of the quantity of rare earths required for manufacturing the currently most frequently used permanent magnet generator. Superconduction, hence, allows setting up of efficient, robust, and compact wind power plants at reduced building, operating, and maintenance costs. 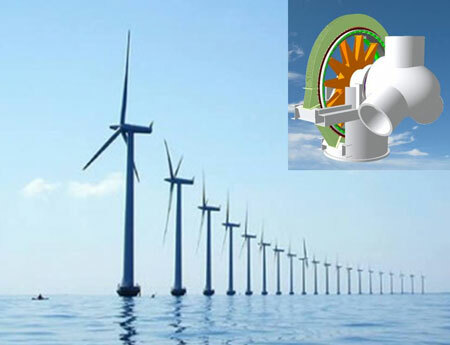 It is the objective of the EU-supported project SUPRAPOWER (SUPerconducting, Reliable, lightweight, And more POWERful offshore wind turbine) to use the high potential of supraconduction for expansion of wind power. In the four-year project that has started now nine partners from industry and science cooperate under the coordination of Fundación Tecnalia Research & Innovation, Spain. Together, the partners develop a wind power plant with direct-drive superconducting generator. The innovative direct drive, in addition, reduces transport and maintenance costs and extends the service life of the turbine. The Cryogenic Engineering Division at KIT’s Institute for Technical Physics (ITEP) contributes the cooling system: Below a certain temperature, superconductors have no electrical resistance and conduct electricity without loss. To ensure proper operation of the superconducting generator, the coils must be cooled below this so-called transition temperature. The researchers at ITEP are developing a rotating low-loss cryostat that cools down the superconducting coils to 20 Kelvin (minus 253.15 °C) through pure heat conduction by means of small Gifford-McMahon coolers provided by the project partner Oerlikon Leybold Vacuum. “Since the cooling performance of such coolers is limited, we must ensure that heat between them and the superconducting coils is conducted well. Besides, we must consider the influence of rotation on the heat pipes we may use. On the other hand, the cryostat needs a highly effective thermal insulation,” explains Head of the Cryogenic Engineering Division Dr. Holger Neumann. Work on the cooling system translates the findings from fundamental research to practice and, hence, is most attractive to young scientists. Karlsruhe Institute of Technology (KIT) is one of Europe’s leading energy research establishments. Research, education, and innovation at KIT foster the energy turnaround and reorganization of the energy system in Germany. KIT links excellent competences in engineering and science with know-how in economics, the humanities, and social science as well as law. The activities of the KIT Energy Center are organized in seven topics: Energy conversion, renewable energies, energy storage and distribution, efficient energy use, fusion technology, nuclear power and safety, and energy systems analysis. Clear priorities lie in the areas of energy efficiency and renewable energies, energy storage technologies and grids, electromobility, and enhanced international cooperation in research.